Sacred Iconography and Personal Creativity – Do Not be Afraid! 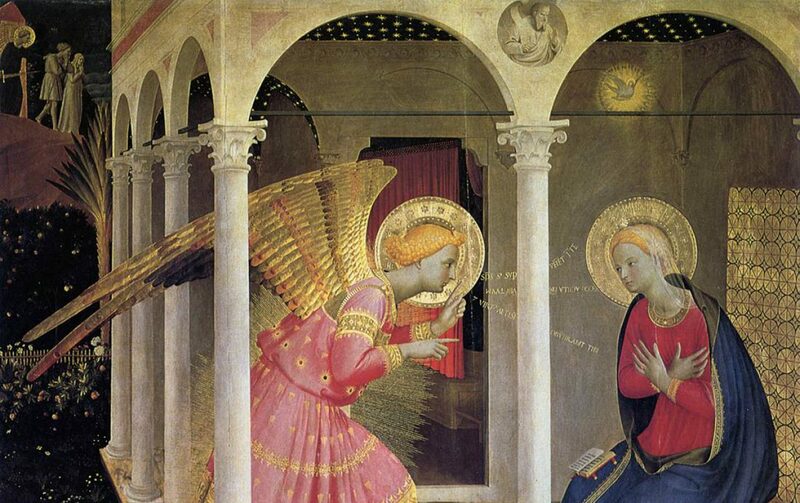 The Sacred Iconography Guild is one of the twelve Sacred Arts Guilds that is sponsored by the Fra Angelico Institute. As of this post we have six members of this Guild who have expressed interest in learning this particular artistic tradition of the Church. Unfortunately, many people in the 21st century do not know the traditions of the Western (Latin, that is the Roman and affiliated rites of the Church) or the Eastern (Orthodox, that is the Coptic, Greek, Russian, and other Middle Eastern Rites) of Christ’s Church. All of these Rites have beautiful liturgies, the Sacraments – Holy Mysteries, and traditions – of which sacred iconography is one. This Institute hopes to be one more voice – among many – bringing these traditions to light to a new generation of people. So this post hopes to begin the survey of what sacred iconography is and how we can participate in it. The word icon is Greek for “image.” Specifically, as it is applied in our usage, it refers to a sacred image that has been painted by a trained iconographer in a way that portrays the sacred presence of Jesus Christ, His mother – “the Theotokos,” His angels, and the saints. Icons in both the Latin Rite and Eastern Rite Churches are venerated – never worshipped. They act as sacred windows or doorways that allow us to view the heavenly realm of divinized humanity or the visual representation of Scriptural truth. Iconography is simply the study of icons, their development through the centuries (the first iconographer is considered to be St. Luke the Evangelist), the techniques and methods used by various “schools” of iconography within specific cultural regions – and within specific national areas. By “school” I mean a collection of iconographers working under a master iconographer that has a specific style through which they portray Our Lord and the sacred people, mysteries, and historic occurrences within the Church’s history. Sacred icons portray theological reality. So, it is mandatory that a sacred iconographer follows the “canon” of iconography that developed through the centuries. The “canon” consists of the rules that an iconographer must follow in painting, that is, “writing” an icon. I say “writing” because the tradition states that an iconographer must be aware of the great responsibility that he or she has in conveying the “Scriptural truth” within the image itself. In other words, the iconographer must not change Holy Scripture. He or she paints (“writes”) what is in Holy Scripture, or within Church history and Tradition, because as Pope Benedict 16th has said: sacred images have an important role to play in the “catechesis of the people.” So the iconographer cannot be portraying his or her version of Scripture – or Church history – to do so would be as bad as one of the Evangelists changing the words of the Gospel as he writes or prints a new copy because he desires to be creative or “express” himself. So this brings up the question of the role that an artist’s personal creativity and skill plays in the development and expression of the written icon. I highly recommend that you go to the websites of my teachers (Peter Pearson; Dimitri Andreyev (Prosopon School); Marek Czarnecki (Seraphic Resorations); and Anna Pokrovskaya Gouriev (Izograph School) to examine their galleries and to see the beauty of their work. Examine an icon of our Lord Jesus or our Blessed Mother by Peter, Dimitri (or his father Vladislav), Marek, Anna (or her mother Xenia) and you will see not only the display of creativity of these iconographers, their skills, their color choices, their simplicity and purity, but also, the truth, goodness, and beauty that is the theological truth of their icons. Their icons are 20th and 21st century pieces of sacred art – yet – they are firmly within the “canon” of the Church’s perception of iconography and serve as models for the expression of Truth, Goodness, and Beauty. As our Lord said to His disciples in the boat as they were being tossed about by the sea – “It is I. Do not be afraid.” This applies to us, too, as spiritual travelers, artists, and novice iconographers – the Lord is with us – we have nothing to fear because we have put our trust in Him. Very interesting. Please, I’d like to see more icons. I had a good collection of Christian Art books. Unfortunately, I ended up donating to the local library when I moved. I figured more can benefit by donating since I had no more in my truck. So I’m glad to see them here. How about those stamps for Christmas?